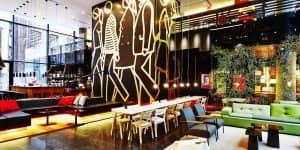 citizenM Hotel Times Square in New York is a hyper modern hotel in the heart of the city centre, born out of a need for a new kind of travel experience: affordable stays at great locations, in inspiring environments. Despite all its futuristic features, this hotel is like an oasis in the urban jungle. To illustrate: the lobby isn’t called the ‘lobby’ here – it’s called the living room. 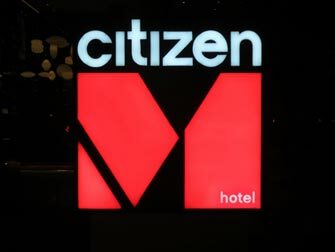 citizenM – without a capital C, with M for ‘mobile’ – Times Square is not that big, but it’s grand. As soon as you step inside you will be pleasantly surprised by the artwork the hotel is filled with. The building has three elevators to bring you all the way up to the 21st floor – to enjoy a cocktail at the rooftop bar that’s open 24/7. But maybe you’d rather grab a freshly baked pastry at canteenM, or some fresh air down on one of their terraces? The check-in works via self service, but the friendly staff is right beside you all the time. And, if you would have otherwise expected, there is indeed free Wi-Fi throughout the whole hotel. 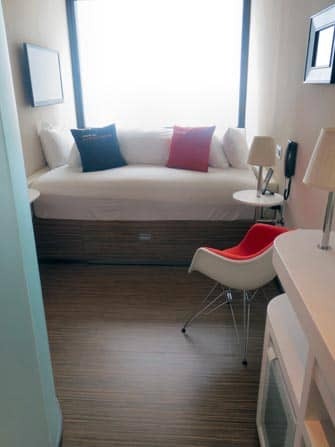 citizenM offers rooms with one king-sized bed. That’s the only option available, no exceptions. Because: ‘everyone’s an equal citizen.’ That one bed is a king-size one though, and a very, very comfortable one at that. After having a lovely shower you can lay down and watch TV. Every room has a decent TV. 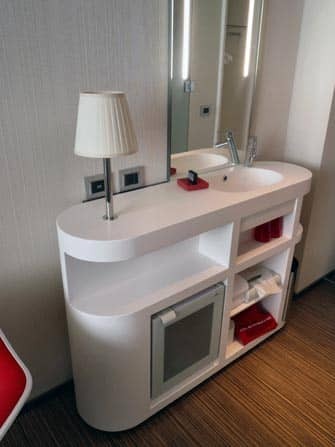 But the feature that really makes citizenM stand out, is its tablets. With these gadgets you are able to adjust anything according to your needs: the light, the temperature, the TV and even the curtains. Nothing wrong with a little bit of futurism. The purple lights adds to the experience, but there is a wall-size window as well, providing you with lots of daylight. 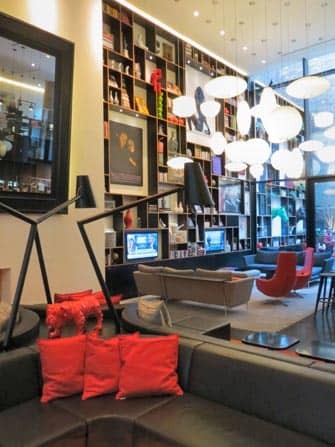 Only the best seems to be good enough for citizenM, so too with their location. It’s top-notch: very central, near Times Square and the Broadway shows – right across Ellen’s Stardust Diner, the retro 1950’s restaurant with singing waiters. Many of the former employees are now on Broadway! 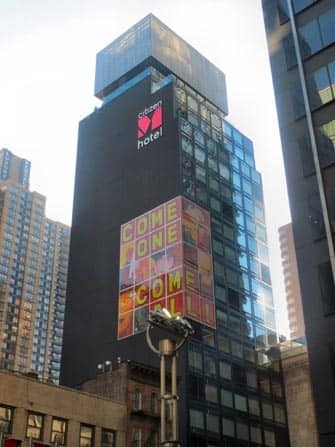 Because the hotel is located so centrally, there are multiple subway lines just around the corner, and the nearest entrance to Central Park is only a ten-minute walk away. 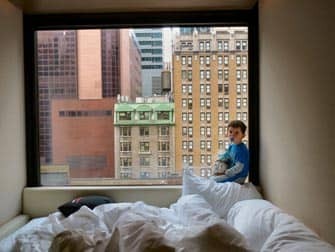 Eric’s Tip: This hotel is one of my favourites in town! The hotel is brand new and modern but already has a great atmosphere. The staff is very helpful and friendly and as described, you get value for money.